Bengaluru, January 14, 2019: Tejas Networks [BSE: 540595, NSE: TEJASNET] today announced that it has signed a Memorandum of Understanding with Government of Kerala as its first telecom knowledge partner and is establishing a Center of Excellence (CoE) for next-generation telecom technologies in the state. The CoE, which is being set up in the new Integrated Startup Complex in Kochi, was inaugurated in the presence of Honorable Chief Minister of Kerala, Shri Pinarayi Vijayan, Smt. K.K. Shylaja Teacher, Hon. Minister for Social Justice and Health, Government of Kerala, Shri. M. Sivasankar IAS, IT Secretary, Government of Kerala by Shri Madhavan Nambiar IAS (Retd. ), Chairman IIITM-K. Several senior dignitaries of Government of Kerala also graced the occasion. Tejas CoE will focus on training, skills development and mentoring of college students, young entrepreneurs and high-potential electronics startups in the state. Senior technologists from Tejas will work closely with the faculty of leading engineering institutions in the state to develop a futuristic, industry-oriented telecommunication training and certification program. 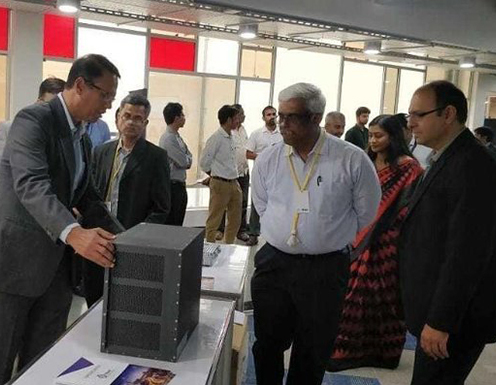 As part of the partnership, Tejas Networks also proposes to set up an advanced networking testbed for cutting-edge technologies such as terabit-scale optical communications, gigabit-scale broadband access, 5G and software-defined networking. About Tejas Networks Limited Tejas Networks designs, develops and sells high-performance and cost-competitive networking products to telecommunications Service providers, internet service providers, utilities, defence and government entities in over 65 Countries. Tejas products utilize programmable, software-defined hardware architecture with a Common Software Code-base, that delivers seamless upgrades of new features and technology standards. Tejas Networks is ranked among top-10 suppliers in the global optical aggregation segment and has filed over 342 patents. Certain Statements in this release concerning our future growth prospects are forward-looking statements, which involve a number of risks, and uncertainties that could cause actual results to differ materially from those in Such forward-looking statements due to risks or uncertainties associated with our expectations with respect to, but not limited to, our ability to successfully implement our strategy and our growth and expansion plans, technological changes, our exposure to market risks, general economic and political conditions in India which have an impact on our business activities or investments, changes in the laws and regulations that apply to the industry in which the Company operates. The Company does not undertake to update any forward looking statements that may be made from time to time by or on behalf of the Company.